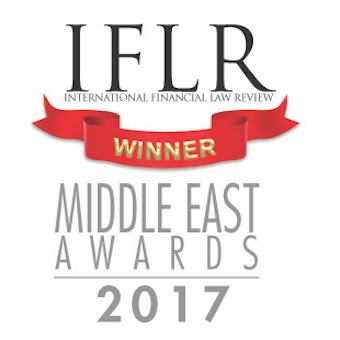 The International Finance Law Review (IFLR) awards ceremony recognizes the best corporate and finance teams, deals, and firms in the legal industry throughout the Middle East. The winners were announced on October 18th, 2017 during the annual dinner at the Burj Al Arab in Dubai. For the fourth time, Ali Sharif Zu'bi Advocates & Legal Consultants received the IFLR Law Firm of the Year for Jordan in recognition of the firm's leading presence in the country and its exceptional performance during the last year. Ali Sharif Zu'bi Advocates & Legal Consultants was also awarded the Domestic Deal of the Year 2017 for the International Petroleum Investment Company (IPIC) / Mubadala Development Company (MDC) merger.